"When Executive Order 9066 is enacted after the attack at Pearl Harbor, children's librarian Clara Breed's young Japanese American patrons are to be sent to prison camp. Before they are moved, Breed asks the children to write her letters and gives them books to take with them. Through the three years of their internment, the children correspond with Miss Breed, sharing their stories, providing feedback on books, and creating a record of their experiences. 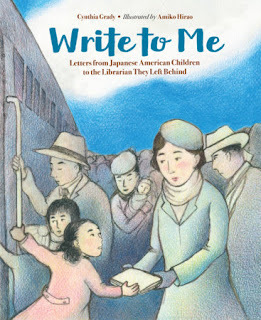 Using excerpts from children's letters held at the Japanese American National Museum, author Cynthia Grady presents a difficult subject with honesty and hope". The Japanese American National Museum had an exhibition called "Dear Miss Breed: Letters from Camp" one can still find information about on their website. I had first heard about the internment of about 120,000 Japanese-American people in George Takeis autobiography "To the Stars. The autobiography of George Takei, Star Trek's Mr. Sulu" (1995). Takei and his family spent four years in a camp. P.S. The museum also held an exhibition about Takei - "New Frontiers: The Many Worlds of George Takei, which "explores the life and career of pioneering actor, activist, and social media icon George Takei, who currently serves on the Japanese American National Museum's Board of Trustees. By examining Takei's diverse experiences and achievements, this entertaining exhibition creates a portrait of a unique individual while offering an innovative means of engaging with the social history of America. Takei has been an innovator on many fronts. Through a curated selection of his artifacts, New Frontiers captures a long and colorful life while also providing a space to reflect on some of the social and political changes that rippled through America during the 20th and 21st centuries. The exhibition begins with Takei's childhood and his incarceration, along with his family, at the Rohwer and Tule Lake concentration camps during World War II. It then moves through his career as one of the first successful Japanese American actors in Hollywood; his public service appointments, including stints on the Southern California Rapid Transit District and the Japan–United States Friendship Commission; his coming out as a gay man and his celebrated marriage to longtime partner Brad Takei (née Altman); his ongoing activism on behalf of the Japanese American and LGBTQ communities; his wild popularity as a social media figure; and much more".